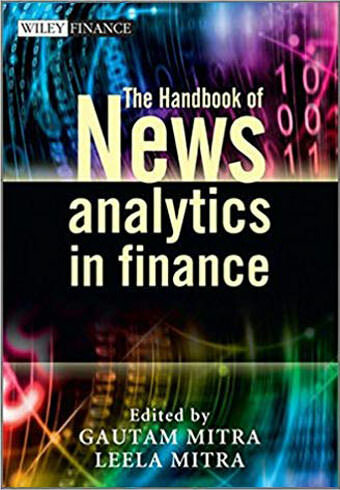 The Handbook of News Analytics in Finance (2011) is a landmark publication bringing together the latest models and applications of News Analytics for asset pricing, portfolio construction, trading and risk control. Designed to provide a rapid yet comprehensive understanding of this topic, the book begins with an overview of News Analytics (NA), and an explanation of the technology and applications. It is then presented in four parts: Part 1 contains an explanation of methods and models which are used to measure and quantify news sentiment. In Part 2 the relationship between news events and discovery of abnormal returns (the elusive alpha) is discussed in detail by the leading researchers and industry experts. The material in this part also covers potential applications of NA to trading and fund management. Part 3 covers the use of quantified news for the purpose of monitoring, early diagnostics and risk control. Part 4 is entirely industry focused; it contains insights of experts from leading technology (content) vendors. It also contains a discussion of technologies and finally a compact directory of content vendors and financial analytics companies in the marketplace of NA. The book draws equally upon the expertise of academics and practitioners who have developed these models and is supported by two major content vendors – RavenPack and Thomson Reuters – leading providers of news analytics software and machine readable news. The book is accompanied by a website which features supplementary resources for news analytics, including models and prototype tools. Dan diBartolomeo CFA, CEO Northfield Information Services Inc.
David Leinweber, UC Berkeley Center for Innovative Financial Technology & Leinweber & Co.
– Hersh Shefrin, Mario L Belotti Professsor of Finance , Santa Clara University, Leavey School of Business. – Peter Carr, Global Head of Market Modeling, Morgan Stanley. Executive Director, Masters in Math Finance, NYU. These players need to continually innovate to stay competitive in an increasingly sophisticated and aggressive market place. They need to provide a differentiated service and produce excess returns. Annotated list of published journal papers and white papers on news.